To encourage safe boating, the Auxiliary conducts courtesy Vessel Safety Checks. A qualified Auxiliary volunteer will examine your boat to verify that it is being operated in accordance with required state and federal regulations. The Vessel Safety Check is not a law enforcement action. No fines or citations are issued. Rather, it is performed only with the cooperation of the owner and designed to educate the boating public. Boat owners are provided with a copy of the evaluation and are encouraged to implement any suggestions given. 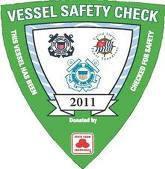 Vessels that pass the check are permitted to display the VSC Decal (below). Want to know the most common reasons boat owners fail a Vessel Safety Check? Read the data!